Angkok Wat is one of those places I have on my must visit list. It took quite a bit of convincing on my part to get the husband to go with me to Siem Reap. He doesn't really like visiting what you call the Third World countries. He is more at home in developed countries and also remember that he only thrives in temperate countries due to his narrow zone of temperature range where he will not melt. 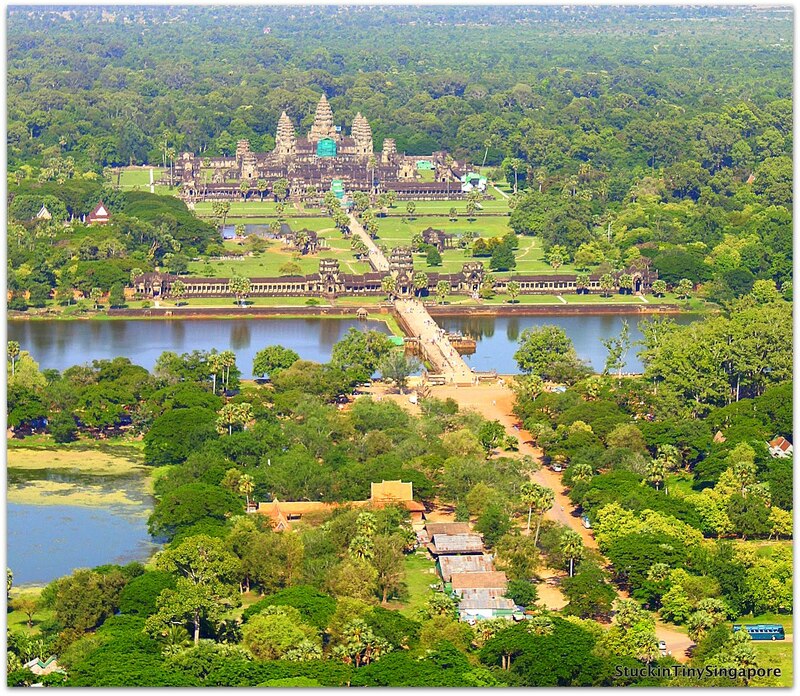 When I finally managed to get him to agree to go to Siem Reap, I immediately went ahead to book our tickets during the week of our Anniversary. We flew from Singapore to Siem Reap via Silkair. Did not manage to get any bargain tickets, but what the heck, it was our anniversary. We found a great little gem of a hotel called Hotel Be Angkor. It is a super unique hotel, whereby there is also 3 rooms. At this hotel, you will not find room numbers, just beautifully crafted individual rooms. Each room is designed to give the guests an absolute one of kind experience. The rooms are decorated with Cambodian influenced furnishings and works of art. With only 3 rooms, you will be showered with the utmost attention but at the same time you will still have privacy if you prefer it that way. The hotel is also located in a great location, in "The Passage", a small charming lane with lots of restaurants and shops to choose from. What is quirky about the hotel, is that to access the rooms, you will have to walk through the McDermott Art Gallery, and the acclaimed AHA restaurant and wine bar by the famous Hotel de la Prix. The three rooms available are: Saffron, Bamboo and Sepia Rooms. To find out more about the rooms, do check out their website. During our stay there, we got to stay at the Sepia Room. 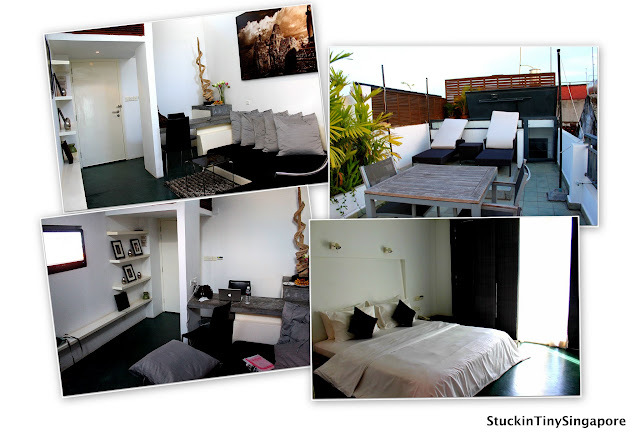 It consists of a two-story atrium living area which has stairs leading to your own private roof terrace with day beds. The room also has a balcony for you to observe the hustle and bustle of "The Passage" and amazingly we were not disturb by the noise from the busy street below. The room has a King size bed, sitting area with a 32" LCD TV. Complimentary wireless internet access is also provided, along with a safe, mini-bar. There is also a lovely breakfast served in your room. For this trip like in Prague, we went with a private guide service. We found Ara through a website that reviewed her services. Ara's story was really touching and based on her other reviews, we were confident about booking her services for our stay in Siem Reap. You can read about her here. I definitely recommend using a guide. She was there to pick us up upon arrival with a personal tutu booked for us. We booked her for all 4 days we were there and she arranged everything for us, including taking us to the temples and explaining to us all the insights of life in Siem Reap. In addition, you can help Ara to build a better life for herself and the orphanage where she grew up, that she still helps and visit. All for a good cause. 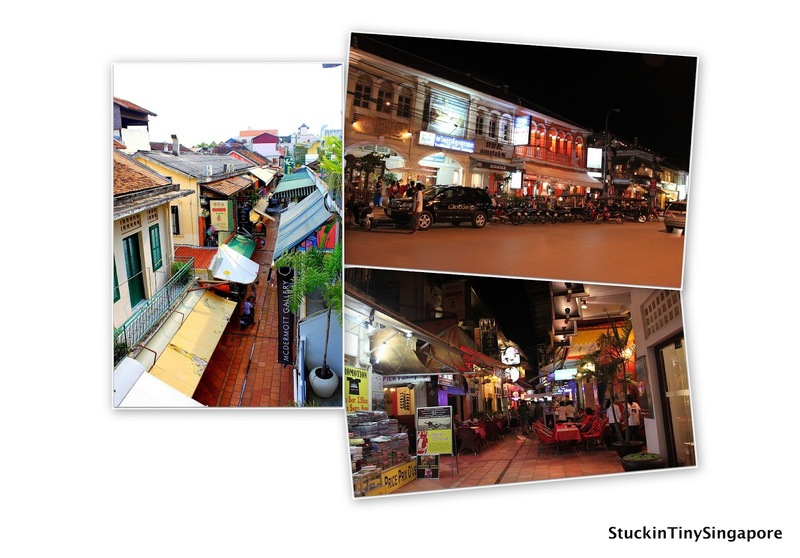 We arrived in Siem Reap in the afternoon, and the heat was unbearable!! We were feeling really warm and immediately felt drained. After Ara picked us up from the airport, we asked if we could take a rest and freshen up prior to going out later. We had requested for her to take us to try a local Cambodian dinner plus show which she promptly arranged. Everything in Siem Reap are charged in US dollars, so make sure you bring lots of dollar notes. It is extremely useful from buying little souvenirs to giving some money to the local people on the street. The dinner buffet plus show was catered for the tourists. There were boat loads of tourists just being ferried by bus, tutus, cars to the venue, left there for dinner and picked up after the show. Guess it is a must -do judging from the packed dinner tables. We had to try our luck at a second restaurant as the first one Ara brought us to was full already by 7pm when we got there. Food was alright. We got to try some local cuisine but for the husband and I who liked our quiet, this was certainly a turn off for us. 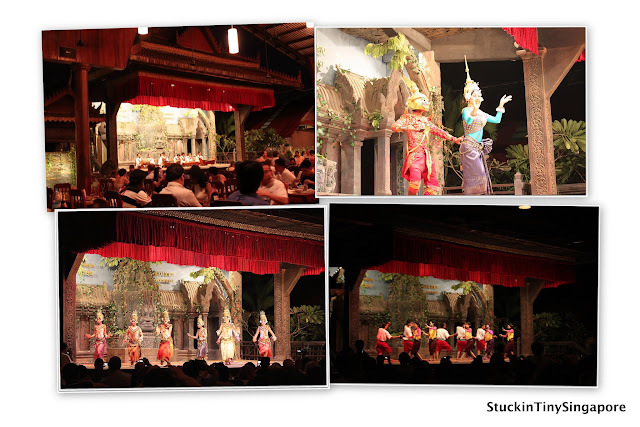 Although we did enjoy the show and it was a nice start to our first night in Siem Reap. Stay tuned for the other posts.